Our ASE™ certified technicians are not only trained to do exceptional automotive repair work, but they also know the importance of customer service. When you bring your vehicle to an auto shop, you want to be sure the mechanic working on it is experienced and trustworthy. At Rockville Auto & Truck Service, we have a team of qualified mechanics at our auto repair shop in Rockville, MD. Each auto mechanic has extensive training and experience performing a diverse range of automotive work on cars and trucks of every make and model. When you are looking for a reputable auto repair shop for your car, you want an established business made up of experienced professionals. Our team of mechanics has more than 80 years of combined experience in automotive repairs. Trust us to do professional-grade work while maintaining the most competitive rates on any type of auto repair work you require. You can always expect friendly assistance from our talented team of dedicated technicians. Our ASE™ certified technicians are not only trained to do exceptional automotive repair work, but they also know the importance of customer service. You can count on us for fast and dependable repairs and honest advice. People trust their vehicles to our auto shop because they know we take the time to do every job the right way. Each auto mechanic on our staff takes pride in being the best at what they do. Quality work is what sets us apart from the competition, and we continue to build our reputation as the most trusted auto shop in our area. We have two locations in Rockville, MD, to better serve our customers. The most important part of our job is ensuring complete customer satisfaction. That means we strive to do exceptional work that addresses the needs of all of our customers, and we never try to push automotive work they do not want or require. 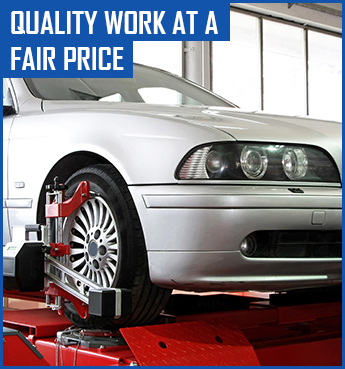 It also means we maintain highly competitive rates on all of the automotive services we provide. In the state of Maryland, you are required to pass a state inspection if you plan on transferring or selling your vehicle. These comprehensive inspections cover almost every component of your car or truck, including the window tint, brakes, tires, wheel alignment, and lighting. It also involves an emissions test to determine what how effective your exhaust system works. If your vehicle does not pass any part of the test, we will let you know and provide the necessary repairs with your permission. Contact us today for more information about the services offered at our auto repair shop. We are conveniently located to serve customers in Rockville, Damascus, Gaithersburg, Germantown, and North Potomac, MD.